We’ve put together a short, but comprehensive guide to the best kids clubs in Hua Hin at resorts and hotels. We’ve included luxury kids clubs to more affordable kids clubs with everything you need to know. In our guide you’ll find the ages that the kids club accepts, opening hours and extra information on activities, games and crafts that are available. At the end of the post, we have included a breakdown of the top kids clubs based on luxury, affordability, location and age. All the resorts and hotels included in our guide are family-friendly and great places to spend a week or two or three in Hua Hin. This kids’ club is appealing to all ages of kids especially older kids. There are futuristic playstation cubicles for kids that will keep them entrained for hours. Two can curl up in there and play video games to their heart’s content. There’s a cot room for newborns, which is unique to this kids club. They also have a kids menu with lots of great options to choose from and you can place orders for their lunch if they are staying all day. There’s an indoor ballroom, trampolines, a movie room, inflatable slides and an arcade-game centre. They also have craft stations that will amuse kids for hours. Kids under 12 need to be signed in, but teenagers are free to come and go. It’s open from 9:00 am – 7:00 pm daily. Entrance is free. This hotel’s motto is all about family fun and family celebrations and so much thought and effort has been put into the kids club here. It’s new on the scene in Hua Hin and the kids club has modern facilities with a ballroom, obstacle course, computer and video game stations and super friendly staff. It’s a little bit away from the beach, but none of that matters when your kids realise that there’s a water park right next door. Guests staying at the Holiday Inn will get free and unlimited access to the Vana Nava Water Jungle. There are free and paid activities. You can download a pdf of all the activities program and costs. During lunch they show a movie, which is free. Children under 4 must be accompanied by a parent or sitter. They offer in-house sitters at 250 baht per hour per child up to 12 midnight. 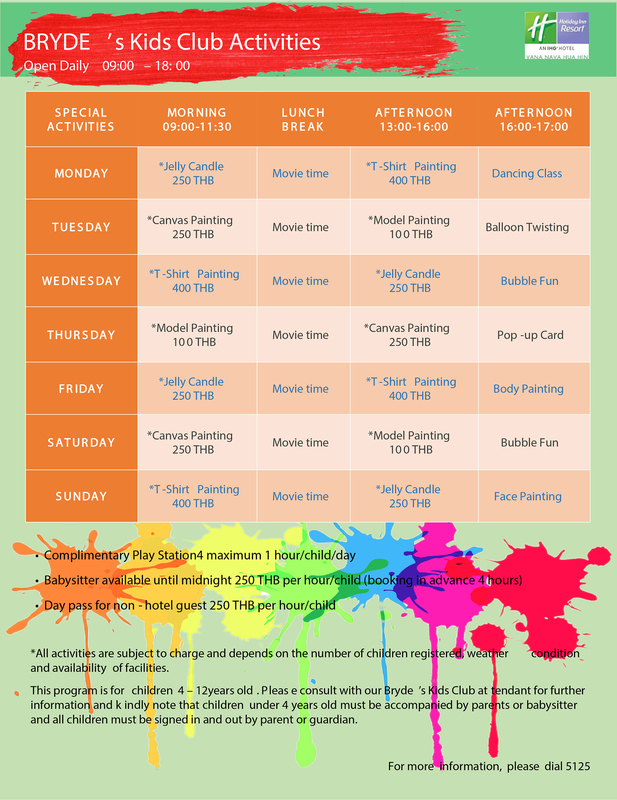 You can book your kids in for additional crafts and activities which cost between 100 – 450 baht depending on the craft. The kids club at the Holiday Inn Vana Nava is for kids aged 4 – 12 years. It’s open from 9:00 am – 6:00 pm daily. The kids club at the Centara is divided into two sections for younger and older kids. There’s lots of sports and putt putt golf for the older kids. Additional crafts and activities cost 150 baht – 500 baht. Kids under 3 can join, but must be supervised by a parent or sitter. While the kids are at kids club, you can check out some of the resort’s in-house sports and leisure activities: pilates, yoga, tai chi, aqua aerobics, tennis and core fitness classes. The resort itself is also centrally located with easy access to the beach and the centre of town. The kids club is for ages 3 – 12 years. It’s open every day from 9:00 am – 7:00 pm. This kids club is pack full of craft options. You can book your kids in for a half-day or full-day at Camp Hyatt and this will include lunch. The resort is a little bit out of the centre of town, but is located right on the beach and it’s a short walk up the road to the popular Cicada Markets. they have a fun waterslide and separate kids pool area with a little man-made sandy beach section, which is great for toddlers. The main pool winds around the resort, which is great, but it means that you really have to keep a close eye on your kids and follow them around as they swim as there are no lifeguards. For kids under 3, you can hire a babysitter in-house that can watch them in your room or at the kids club. There’s also a secure playground that’s part of the kids club with a cubby house, slide, swings and grass areas. The kids club us for ages 3 – 12 years. The kids club runs every day, with crafts that include T-shirt printing and candle making. There’s a playstation and lots of boardgames. When there’s enough kids in attendance they’ll go out to the beach and play sports together. Activities are organised daily for the kids by the fitness team. Kids are welcome to come and go throughout the day. While the kids are taken care of, you can escape to the adults only pool at the resort and really relax and unwind. The kids club itself is decorated with an ocean theme and is super welcoming and inspiring for kids with comfy beanbags and colourful murals decorating the walls. The kids club is called Star Club and it’s bright and modern with lots of comfy places to sit and play. For the older kids, they have desk areas where they can sit and use computers or play video games, however Internet and video game use are not free. Additional crafts and activities range in cost from 100 baht to 450 baht. There’s also an outdoor play area. This resort is spread out and is great for exploring with kids. They have a separate toddler pool. The main pool is very large, so you’ll have to keep an eye on your kids when swimming. The kids club is open from 9:00 am – 6:00 pm, but is closed from 12:00 – 1:00 for lunch. The hourly rate for kids to attend is 150 baht per hour. Kids under 4 are free when accompanied by a parent. This a great resort for families who want luxury plus a family-friendly atmosphere with beautiful pools and shallow areas for kids to splash and play in. This resort has a country-club-by-the-sea feeling. It’s a little more compact that the other resorts, but the grounds, and pools are immaculate and are centre stage of the resort. You can get a cabana for the day and easily keep an eye on your kids as they splash and swim. There’s also a pool bar that you can swim up to for cocktails and fresh coconut juice. It’s also located directly across the road from Bluport Mall, which is a great place to spend an afternoon out of the sun. There are some great kids activities there too, such as Whaley Port. At the InterContinental their kids club, Planet Trekkers, has a cultural aspect. They try to incorporate local crafts and activities so that kids know that they are in Thailand. They offer garland making, merit making, a Thai herb garden tour and a kids Thai kickboxing class. There’s also a small and secure outdoor play area. It’s free for kids aged 4 – 12 years and is open daily. There are games, painting, crafts and a kids cinema with popcorn — which is great if your kids need a break from the sun — all free of charge. The pool is kid-friendly and has a fun slide for kids. There’s babysitting services offered at 300 baht per hour per child for kids under 3. The kids club is available for kids aged 4 – 12. The Hilton also offers kids activities and crafts by the pools, such as nail painting, hat making and and sculpture painting. Novotel wins because they have the video game pods. The Hyatt offers in-house babysitters employed by the hotel. Sheraton has a toddler pool and a kids club. Hyatt also has a toddler pool. The Holiday Inn gives guests free access to the water park next door – Vana Nava Water Jungle and it has a toddler area. Holiday Inn Vana Nava offers in-house babysitting at 250 baht per hour per child. We hope you’ve found and discovered all the information you need when making a choice about which resort to stay at in Hua Hin that has the best kids club for you. Hua Hin is a great family destination in Thailand and it has some of the best kids clubs and friendly staff to match. Hua Hin is a great destination for a family and there’s lots to see and do apart from having some excellent kids clubs.